Fort Yukon (Gwich'in: Gwich'yaa Zhee, translation: "House on the Flats") is a city in the Yukon-Koyukuk Census Area in the U.S. state of Alaska. The population, predominately Gwich'in Alaska Natives, was 583 at the 2010 census, down from 595 in 2000. Fort Yukon is the hometown of Alaska Congressman Don Young. Served by Fort Yukon Airport, it is also known for having the record highest temperature in Alaska. During the Klondike Gold Rush, in the winter of 1897–1898, Fort Yukon received two hundred prospectors from Dawson City, which was short of supply. A post office was established on July 12, 1898 with John Hawksly as its first postmaster. The settlement suffered over the following decades as a result of several infectious disease epidemics and a 1949 flood. On February 7, 1984 a Terrier Malemute-type sounding rocket, with a maximum altitude of 310 miles (500 km), was launched from Fort Yukon. Fort Yukon is located at 66°34′2″N 145°15′23″W﻿ / ﻿66.56722°N 145.25639°W﻿ / 66.56722; -145.25639 (66.567586, -145.256327). Fort Yukon is located on the north bank of the Yukon River at its junction with the Porcupine River, about 145 miles (233 km) northeast of Fairbanks. 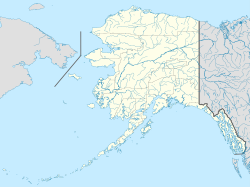 The highest temperature ever recorded in Alaska occurred in Fort Yukon on June 27, 1915, when it reached 100 °F or 37.8 °C. Until 1971, Fort Yukon also held the all-time lowest temperature record at −78 °F or −61.1 °C, and it still holds the record for the lowest mean monthly temperature when the notoriously cold month of December 1917 had an average daily temperature of −48.3 °F or −44.6 °C and the minimum averaged −58 °F or −50 °C. The climate regime is a strong continental subarctic climate with severe winters, being less influenced by chinook winds than areas to the west – the winter season absolute maximum being 17 °F or 9.4 °C colder than in Fairbanks. Summer temperatures are exceptionally high for such a northerly area, being far warmer than the tree line threshold. In the Summer Fort Yukon has midnight sun and in December there is no sun at all. Fort Yukon first appeared on the 1880 U.S. Census as an unincorporated village of 109 residents. Of those, 107 were members of the Tinneh Tribe and 2 were Whites. It did not appear on the 1890 census, but has returned in every successive census since 1900. It formally incorporated in 1959, the year Alaska became a state. As of the census of 2000, there were 595 people, 225 households, and 137 families residing in the city. The population density was 85.0 people per square mile (32.8/km²). There were 317 housing units at an average density of 45.3 per square mile (17.5/km²). The racial makeup of the city was 86.05% Native American, 10.76% White, 0.17% Black or African American, 0.17% Asian, and 0.17% from other races, and 2.69% from two or more races. Hispanic or Latino of any race were 1.34% of the population. Yukon Flats School District operates the Fort Yukon School, serving Fort Yukon. ^ 1996 Alaska Municipal Officials Directory. Juneau: Alaska Municipal League/Alaska Department of Community and Regional Affairs. January 1996. p. 57. ^ "Mailing Addresses and Contact Information Archived 2016-12-20 at the Wayback Machine." Yukon Flats School District. Retrieved on December 4, 2016. This page was last edited on 19 December 2018, at 16:22 (UTC).